Abuse takes place in homes, in dating relationships, in work situations, marriages and parent-child relationships. If you are experiencing any of the behaviors listed, please call National Domestic Violence Hotline at 1-800-799-SAFE (7233), 1-800-787-3224 (TTY) or your local domestic violence center to talk with someone about it. Abusers will continue to abuse. They will not stop if you try harder or love them more. 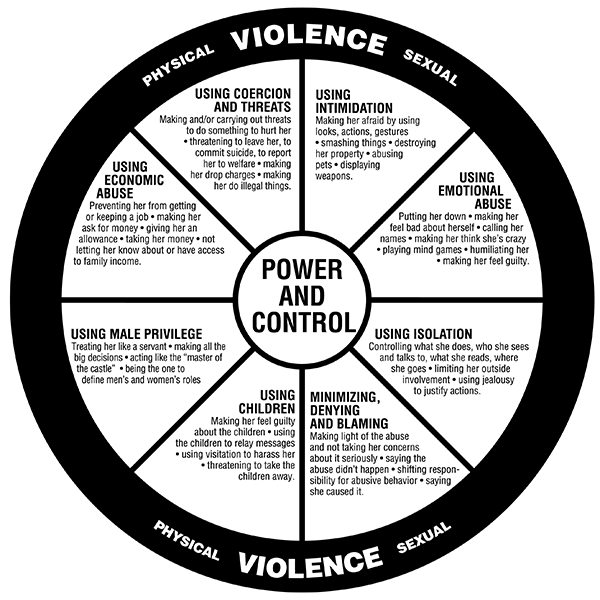 You can read about the Cycle of Violence at http://www.domesticviolence.org/cycle-of-violence/. Are there laws that protect women and children from abuse? YES! Find laws in your state, http://www.womenslaw.org/laws.php (This includes restraining orders, child custody and housing protections. Helpful information for "Preventing Domestic Abuse Crimes"
For North Carolina: http://nccadv.org or call (919) 956-9124. The list of providers in the state is here: http://nccadv.org/get-help/programs-list and most of these have shelters, which would be a very important list for people to have who are looking for a safe place to go if they decide to leave their home/situation. Domestic Abuse Intervention Programs (DAIP) began in 1980 as an initiative to reform the criminal justice system in Duluth, Minnesota. At that time, victims of domestic violence had little recourse when being assaulted by their intimate partners. Perpetrators were rarely arrested unless the assault happened in front of an officer or the injuries sustained by the victim were serious. Choices for victims were limited—initiate criminal justice charges, endure the abuse or flee the relationship. The Duluth Model has evolved and changed over the last 30 years and has spread across the globe. DAIP continues to work toward ending violence against women through its programs in Duluth and in partnership with domestic violence practitioners around the world. The mission of Domestic Abuse Intervention Programs is to end violence against women. We give voice to diverse women who are battered by translating their experiences into innovative programs and institutional changes that centralize victim safety. We partner with communities worldwide to inspire the social and political will to eliminate violence against women and their families.